I prefer the shot on the left. I am assumng the first shot is the "after" as she looks tired and dull in the second. (Could just be the lighting of course.) I can't see much difference actually. I assume from the bloated lips in the second picture that it is the after shot. I'm with Soph; the first image is far more attractive, softer, more feminine, nicer facial expression. She has a look that I find very annoying, the 28 year old botoxed upper face and the 48 year old lower face. I see it a lot on suburban women here in the Bay Area. isn't the shot on the left the "before" picture? If it costs 50K to look like the "after", I'd keep the money - she looked better (and younger) before! If the pic on the left is the "After" then I think its money well spent. She looks like MacKenzie and she looks totally natural. I like her new haircolor (lighter) and her new makeup, everything. She looks early 40's and looks like she's aging great. I'm very happy for her and that she can do all this without looking pulled. Fifty thousand dollars for what? To look like that? She may as well have bypassed the cosmetic tweaks and given the money to a deserving charity. I am not understanding why she did not instead use the money to change the texture of her skin, as she has quite bad pock marks from acne and that does not look like it has changed. She looks ok. The work is subtle and she doesn't look severely plastic. And I'd believe the $50,000. I believe she only got the botox instead of extensive surgery because she just got out of rehab. She even said that she had her veneers/crowns put in without Novocain. That's probably why she opted for these procedures. Just a guess. She definitely needed a face and neck lift... would have taken 10 years off her and would have been cheaper than everything else she had done. It's tough to tell what's really going on in those pics because the lighting is so different. Bad lighting can make anyone look like they haven't slept in a week. I think her eyes are improved, looks like she had some excess skin above her upper eyelid removed. I agree she would look better if she had a lower facelift. I would trim her nose slightly too, but not too much. 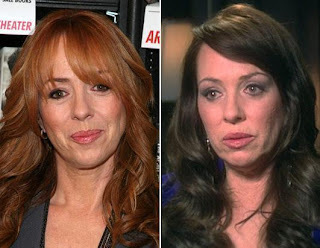 I saw her on TV and the fillers are much more apparent when her face moves. There's way too much filling going on these days. It should not be used to attempt to restore a completely youthful appearance, it should be used conservatively to knock just a few years off. We really need to stop this nonsense that thin lips or skin or a few lines look bad on women. We allow them on men! Why such a discrepancy?